A Deeper Truth explains why 9 out of 10 new products fail, the neuroscience behind human choice, and how disruptive successes leverage the fundamental nature of human decision-making. Backed by research across a dozen disciplines, A Deeper Truth explains how genetics and neurology impact perception, behavior, and choice. It also succeeds in providing a comprehensive explanation for disruption even in the arenas where Clayton Christensen himself acknowledges Disruption Theory fails. Filled with stories and anecdotes, this book succeeds at being entertaining while defining the neurological, social, and evolutionary forces that influence our choices to adopt or reject new things. From products to social norms, these forces are reduced to rules that can be readily applied to de-risk innovation, predict how groups will respond, and ensure the success of your next change initiative, new product, startup, or innovation. Catherine is an author and professional editor in Melbourne Australia. If you’re fascinated by human behaviour, psychology, and why some innovations take off and others totally flop, I couldn't recommend this highly enough. Tim Stroh literally read thousands of research studies and books to figure out why humans make the decisions we do – particularly the totally irrational ones. 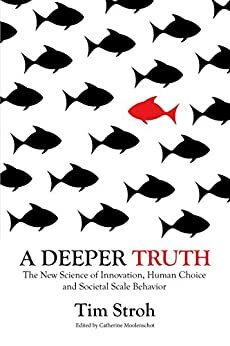 It’s a gripping read, an exceptional explanation of societal scale behaviour and decision-making, and what that has to do with innovation success. And the best bit is he has condensed it all into one phenomenal book - you should have seen how long the first draft was! Tim Stroh you’ve given us all a great gift through your hard work! This writer has a storytelling style with engaging and informative anecdotes and examples. It presents a common sense explanation of the motivation behind the choices we make. A must read for anyone in marketing or entrepreneurs. These skills are valuable tools in eliminating luck from a product launch. I came away understanding more about human nature. Very Profound "Invaluable "
A fascinating and accessible read that challenges the way we think. Eloquent and peppered with interesting anecdotes it is a must read for the thinking person. I've never read a book quite like Tim Stroh's "A Deeper Truth," and I don't know that anyone else has either. Examining the question of why humans make really big wrong decisions, Stroh examines history, psychology, economic theories, and personal anecdotes, to come up with his rationales for the apparently irrational. The biggest surprise in this, along with its quick brevity, is the book's humor. Throughout, Stroh offers serious researched commentary, with a constant "smile" to remind us that human behavior, even his own, has always been flawed at best and more often absurd. In the end, though, his conclusions about groupthink, and of our inclinations to make choices we'd be better off not making,are serious and sobering. Whether we're talking about why people choose lower-quality music-listening devices or elect profoundly unqualified leaders, the greatest need the book exposes is for solutions to all this. We can only hope Stroh continues his quest, and finds some answers that just might save us all. Tim Stroh’s A Deeper Truth makes an important contribution to studies of human behavior. Drawing on a vast array of psychological, business, and economic studies, Stroh steers readers through the seemingly irrational behaviors of humans and other creatures. For example, experiments show that most people seem to prefer status over money. Stroh provides many windows onto our decision-making; for example, the cuteness of young mammals extends beyond its own species. If a big cat (leopard, lion) has killed a female baboon, she may see fit to raise an infant baboon as she would her own offspring. Stroh’s navigation of the complex labyrinth of our decision-making processes makes A Deeper Truth essential reading for businesspeople, social scientists, and other curious readers. The book is a storehouse of relevant quotations and excerpts from leading thinkers in various fields. Stroh’s anecdotal style of writing, prevents the reader’s attention from flagging at any point in this complex discussion that runs over 200 pages. The short paragraphs and bold highlights of key concepts and arguments throughout the book, gives the reader a feeling of a new style of creative non-fiction that’s closer to online publications and farther from convoluted deductions that require focused attention.